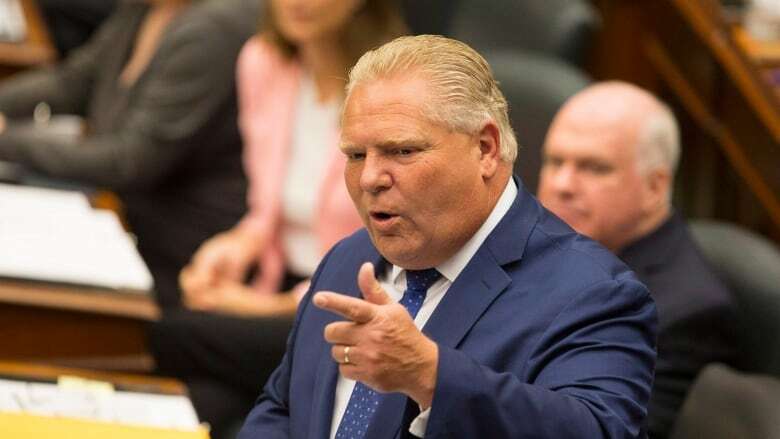 Premier Doug Ford has ordered the Ontario Legislature to sit on Saturday in an attempt to speed up passage of the new bill to slash the size of Toronto city council, CBC News has learned. An email marked "Strictly Confidential" was sent to Progressive Conservative MPPs Thursday night ordering them back to the Legislature Saturday at 1 p.m.
CBC News obtained a copy of the email. "In order to pass Bill 31 in a timely manner, the House will be sitting at atypical times over the next week," it reads. The PCs and the New Democrats have been battling over how quickly the bill should be passed, with the NDP attempting to slow the process down. Bill 31 was introduced Wednesday. It invokes the notwithstanding clause to override Monday's Ontario Superior Court ruling, which found the Ford government's previous attempt to reduce the number of wards in Toronto unconstitutional. Earlier on Thursday, the legislature was adjourned until Wednesday of next week. MPPs unanimously agreed that the House will not sit Monday and Tuesday, so that they can attend the annual International Plowing Match in Chatham- Kent, located in southwestern Ontario. Meanwhile, the city official responsible for running Toronto's Oct. 22 election said every delay resulting from the battle between the province and the city affects her ability to ensure fairness in the vote, regardless of whether it involves 47 or 25 wards. "We have hit a tipping point," said Ulli Watkiss. "Both scenarios are becoming virtually impossible for us to carry out." Toronto had challenged the province's council-cutting legislation in court and a judge agreed that passing the bill in the middle of municipal election campaign violated the freedom of expression rights for voters and candidates. But Ford quickly announced he'd use the notwithstanding clause to override the ruling. His government is also appealing the decision. Toronto councillors decided Thursday to continue to fight the province's legislation in the courts, with Toronto Mayor John Tory saying the city had to pursue all legal options regardless of the odds. "I firmly believe you don't make a bad law better by overriding the Charter of Rights and Freedoms," he said. "We're all here to keep standing up for Toronto."